A new adventure of brotherhood and magic from beloved fantasist Dave Duncan. There is magic in Jorgary, but it is regarded as Satanism, rituals performed by Speakers who are in contact with the Devil. The Speakers, though, believe that the Voices they hear belong to saints. Anton is not a Speaker...but Wulf is. Anxious to impress the court, Anton exhibits spectacular horsemanship at a royal hunt, with a little boost from Wulf. Two nights later he is dragged before Cardinal Zdenek, the king’s chief minister. Zdenek offers him an earldom and anything else he could dream of if he will ride at once to a strategic fortress at Cardice and take command there. The count and his son have died, victims of both treason and witchcraft. The cardinal thinks that neighboring enemies are preparing to invade, using "modern" arms to capture the fort. Mortal resources alone will not suffice, but Zdenek knows that Anton’s improbable jump at the hunt was aided by supernatural power. 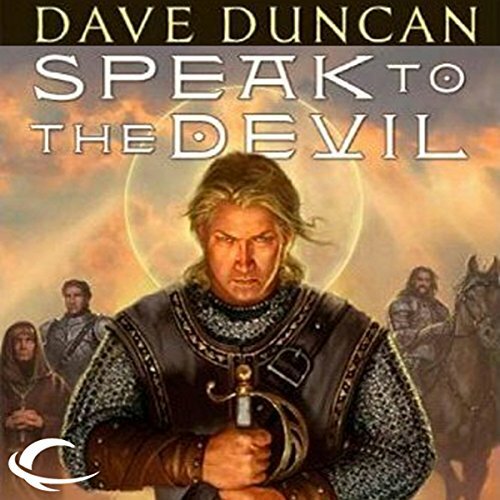 ©2010 Dave Duncan (P)2012 Audible, Inc.